I know it’s probably a massive faux pas to be cooking butternut squash at this time of year, especially as I try to eat with the seasons when I can, but I’m just going to throw this pretty bowl of deliciousness out there and ask you pretend it’s Autumn and this is the perfect dish. I was feeling something healthy but filling, and spelt pasta is just that – nutty in flavour and full of fibre which makes it feel much more substantial than regular pasta. I was also in need of something I could eat one-handed whilst catching up on the latest episode of Ru Paul’s Drag Race; so many fierce looks, I couldn’t afford to take my eyes off the screen for too long. Twirling spaghetti was out of the question. 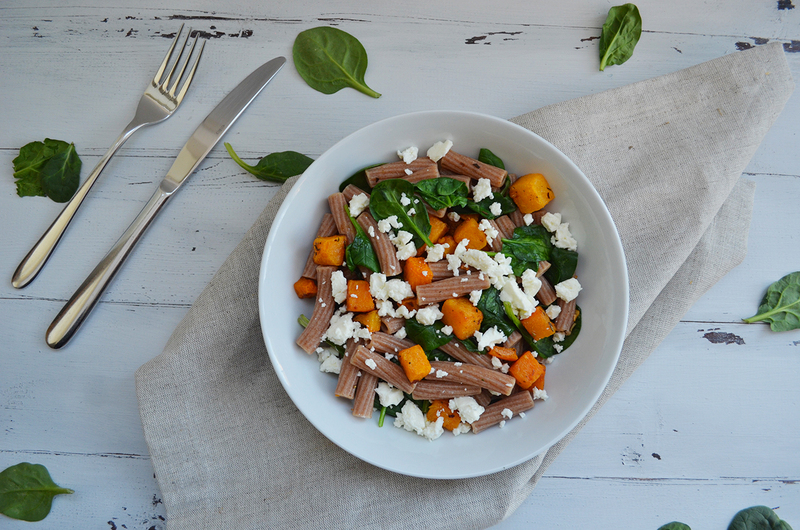 This is a really simple dish to make; the butternut squash roasts in under half an hour, and the pasta cooks in just 9 minutes – yet another reason I am a big fan of spelt, it requires minimal patience. The spinach is wilted lightly using the residual heat from the pasta, and then it’s sprinkled with crumbled tofu feta, for creaminess with a tang. The butternut squash is really the star of the show here – I roasted the cubes in a drizzle of garlic oil with fresh chopped rosemary and dried chilli flakes, for subtle heat. I could easily devour the tray of roasted squash on it’s own, but the finished dish is worth exercising a little will power. It’s not a crime to pinch a couple of cubes while you wait, though. 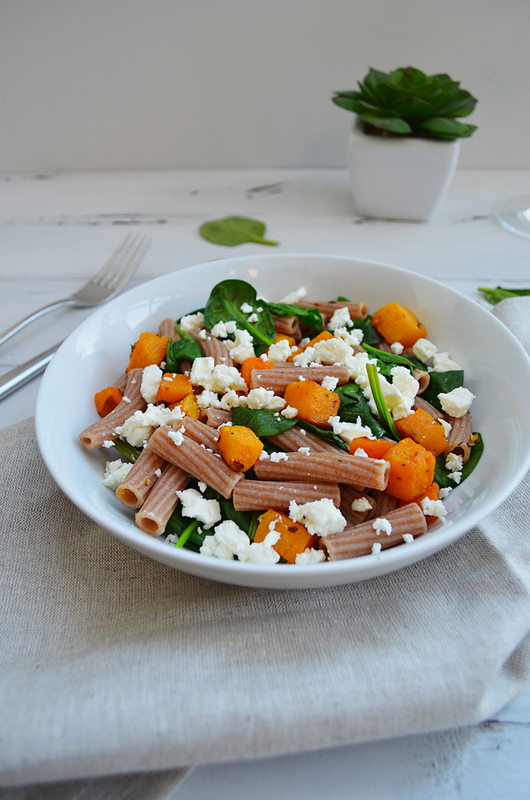 A light and delicious pasta dish, made with rosemary roasted butternut squash, wilted spinach and hearty spelt rigatini, topped with crumbled tofu feta. Preheat oven to 220°c/200°c fan. Place butternut squash cubes onto a baking tray and drizzle with garlic oil, then add chilli flakes, rosemary and season with salt and pepper. Mix well to ensure the cubes are evenly coated. Place the butternut squash into the oven and roast for 25-30 minutes until they are crisp on the outside and tender inside. 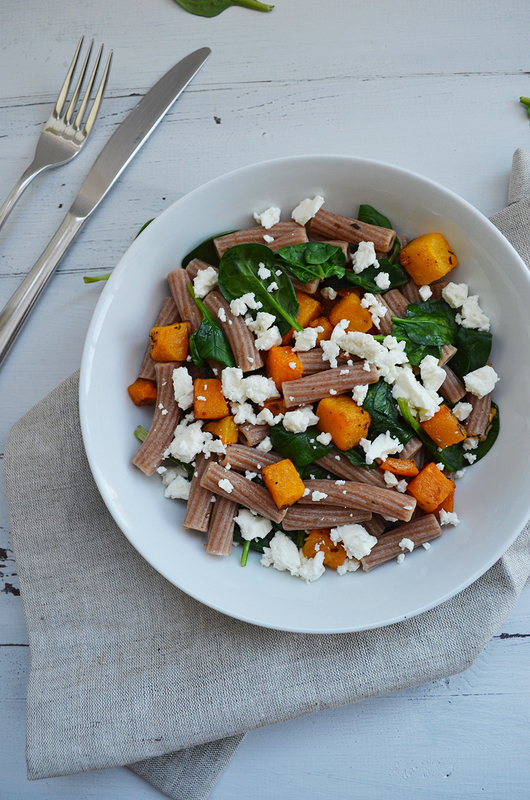 Turn off the heat, but leave the butternut squash in the oven to keep warm while the pasta cooks. Cook the spelt rigatini for 8-9 minutes, until cooked but with a bite. Spelt pasta gives the perfect al dente texture. Drain the pasta, then place back into the pan with the spinach. Stir well and cover for 2 minutes, until the spinach has wilted slightly, then stir in the butternut squash cubes. Serve and top each bowl with plenty of crumbled tofu feta. This looks so gooooood, I may have to give this recipe a try but maybe substitute the pasta for quinoa!